Ever since broadband began to appear in the United Kingdom software companies and service providers have looked to use it for voice traffic as well as internet data. In fact the technology and the software was available before broadband came out. Most internet chat and instant messenger tools developed voice add-ons before broadband and there were a number of standalone internet telephone programs available too. But they didn’t really work very well on ordinary modems, speech quality was poor and connections would drop out frequently. Users were also limited to speaking to other users of the same software. Few of these software-based services gained enough critical mass to be able to invest in the infrastructure necessary to be able to break out of their own worlds and offer phone calls to real telephones. Broadband gave the necessary bandwidth for the technology to work well and very quickly different companies were vying for the attention of consumers and businesses alike. The technology is known as Voice over Internet Protocol (or VoIP in the trade), and as it became popular the critical mass was achieved that allowed many of these companies to offer the ability to deliver calls in and out of the ordinary telephone networks. In the business sector companies with many separate offices can use VoIP to speak to one another without charge once each office has a broadband connection. This could either be done through computers with headsets or by linking intelligent PABX's to the broadband connection. In the home there are two main applications. The first is used by connecting a PC to the internet and then running VoIP software. There are many different companies out there but there are a couple of clear leaders at the moment. Most of these packages allow you to speak free of charge to users of the same software and offer good rates (though not always the best) for calling ordinary telephones, both national and international. 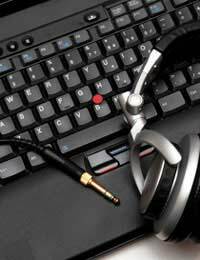 Going through a computer means using a headset and microphone which can cause problems. It can be tricky to get a headset and microphone on in time to answer a call if you're not already sat there with it on. This can be resolved by buying a telephone handset with a USB interface which can be permanently plugged in to a USB port on the computer. Picking calls up then becomes as easy as picking up an ordinary telephone, as long as you're near enough to hear the computer's phone ring sound effect. The second type of VoIP implementation does away with the PC and uses a little box to connect directly to the broadband connection on your landline master socket. This is a much easier system to deal with in the home, particularly for people who perhaps don’t have a PC or don't have it on all the time. The phone handset that connects to the box can be placed alongside a normal phone so as long as they have different rings you can simply pick up the correct phone when it rings. For calling out, you may have to mentally toss-up which phone to use. The type of number you are calling and the call package that you have on your landline will determine whether to use your ordinary phone or your VoIP phone. Finally, it's worth mentioning that as this technology matures, it becomes less necessary to be aware of it. There are already some services available from telephone companies which will combine your landline and broadband in one box which will then use VoIP for all the calls. This means you can get the benefits of cheaper calls without having to care about what sort of technology you're using, and for many consumers that's a godsend.